Editor’s note: Baseball is back and Yahoo Sports is previewing all 30 teams over the next month. This year’s previews will focus on fantasy and reality, as our MLB news staff and our fantasy baseball crew come together to assess each team before opening day. Next up, the Oakland Athletics. The Oakland Athletics were the surprise team of 2018, competing for the AL West title, winning 97 games and getting into the wild-card game. Now the question is, can they do it again? 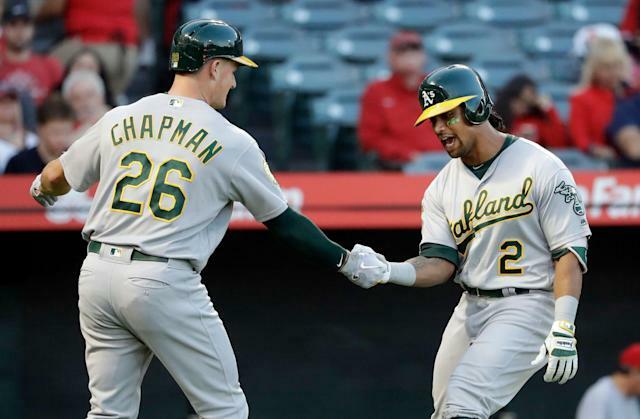 The 2019 version of the A’s face some of the same challenges and have some of the same strengths, among them Matt Chapman, who has sneakily become of the best players in the league and Khris Davis, who mashes homers with the best of them. The A’s have some intriguing young pitchers on the way, but keeping them healthy has been the problem. Last year, they rode the likes of Edwin Jackson, Brett Anderson and Trevor Cahill into the postseason. They’re still without ace Sean Manaea, who needed shoulder surgery. The promising Jharel Cotton should return from Tommy John surgery soon enough. Top prospect Jesus Luzardo is on his way too. The young pitchers and the established mashers all make for good interesting fantasy options. In fantasy or reality, it’s still hard to count too much on the A’s when you just look at the names on the roster, which isn’t as much of a diss as it might sound. The most interesting move the A’s made this offseason was trading for former Texas Rangers hot-shot prospect Jurickson Profar. He’s a versatile guy who played every infield position for the Rangers last year, plus time at DH and in the outfield. Profar has never lived up to the hype, but he’s now 26 and coming off his best season in the big leagues. If he’s able to finally breakout, the A’s could have gotten a steal. Elsewhere, they signed Marco Estrada, Robbie Grossman, Nick Hundley, who should all factor heavily into Oakland’s plans. Joakim Soria and Jerry Blevins added some depth to the bullpen. Who will be Oakland’s fantasy breakout? Who is the A’s fantasy sleeper? It’s all about Luzardo. The 21-year-old Luzardo complements a fastball that hits 93 mph with an excellent changeup that should fool major-league hitters once the Athletics decide to call him up. That could prove to be soon. Given the team’s rotation, it’s not hyperbole to say Luzardo might already be the best starter on the team. 1. Healthy rotation: This could be said for all 30 teams, but it's especially true for the A's. 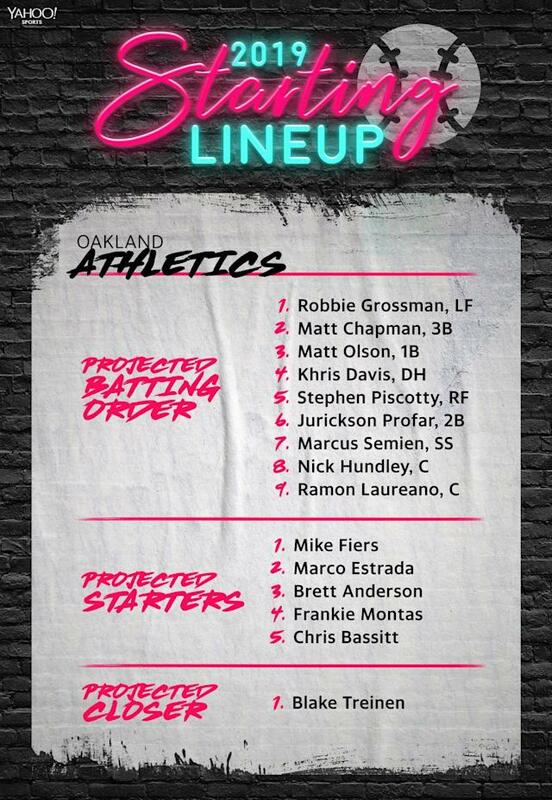 Oakland's rotation was devastated by injuries last season, but overcame it by incorporating openers into the mix. What worked then isn't guaranteed to work again this season though. Considering they're already without Sean Manaea and Jharel Cotton, the A's will need reliability and durability from a group that includes Mike Fiers, Marco Estrada and Brett Anderson. 2. Keep cranking homers: Even if the rotation holds up, Oakland will need another strong year from a lineup that helped them go toe-to-toe with the AL's best last season. In the end, the A's trailed only the New York Yankees and Los Angeles Dodgers in the home run department, mashing 227. The year before, they hit 234. They're clearly capable of leaving the yard in bunches, and that aspect might be even more critical in 2019. With a city as rich with music history as Oakland, a Drake song isn’t going to cut it. There’s only one man to recruit here and his name is Too $hort. While most — OK, almost all — of Short Dog’s songs are a little too profane for our purposes here. Luckily, “I’m a Player” has a radio edit and and the bassline still smacks.